Last year I noticed a trend of people choosing one word to focus on for the year. I decided that this year I would do the same and have been toying around with all sorts of different words trying to come up with the perfect one to define what I want this year to be like for me. This personal progress project is the way I’m going to do that. A couple of weeks ago I was asked to start working with the 12-13 year-old young women, the beehives, for church. Right after I received the phone call, I immediately got online and started looking through all of the materials for the lessons I’ll be teaching. As I was looking through the materials, my word for the year hit me like a ton of bricks. This is it. I want my year to be one full of progress, progression, and forward movement toward a better condition. Toward a better me. It’s been almost two years since I had my little boy, and I feel like I’ve either moved backward or remained stagnant in pretty much every part of my life other than being a mom. And the being a mom part is kind of just movement by default – you have to be more involved when your baby goes from sleeping all day to climbing all over everything. And now it’s time to move forward. It’s time to start progressing again. Let’s jump back to those young women materials I talked about earlier. 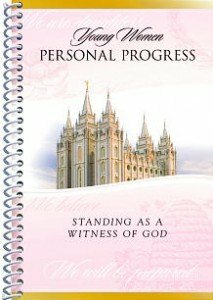 One of the coolest things that the LDS church does for the young women is what’s called personal progress. They put together this amazing program full of goals, projects, and activities centered around eight core values (faith, divine nature, individual worth, knowledge, choice and accountability, good works, integrity, and virtue) to help the young women continue with their own personal progression. Each of the values has like 6-8 smaller activities (e.g., learn a new skill and memorize a scripture for knowledge) and then one big 10+ hour project that the young women can choose for themselves. And all of them are goals that are actionable and can be crossed off once complete. Learn more about the young women’s personal progress program. 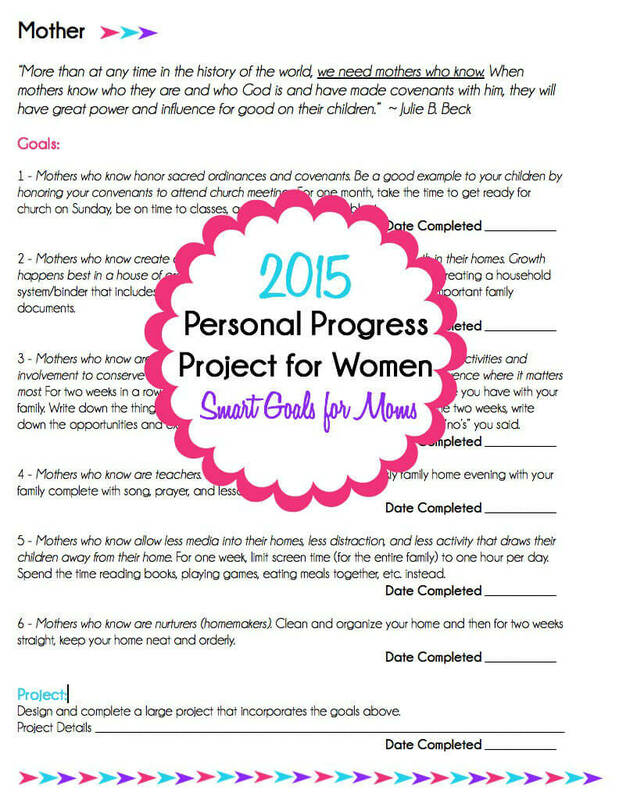 I’m going to borrow this idea and create my own personal progress project for the year. Rather than focusing on core values like the young women, I am going to plan it out based on the key roles in my life. And while there are twelve listed below, I am not going to be working on them one month at a time. Instead, I’ll be working on various goals from different categories (e.g., one from wife and one from mom) at the same time. Wife – date nights, better communication with my husband, etc. Homemaker – cooking, cleaning, bills, organizing, etc. Accountant – saving money, finances, etc. Family Member – sister, daughter, in-law, granddaughter, etc. Athlete – Exercise, health, etc. Student – things to keep me mentally alert, educated, etc. Friend – strengthening friendships, making friends, etc. Me – Time to take care of myself by eating better, getting ready, pampering, etc. I haven’t finalized all of the individual goals that go along each of the roles yet, but here’s one example. You can download free printable versions of all of my personal progress worksheets below. I would love to know if you download them and try it on your own! Do you set goals each year or define a word for the year? I love this idea. I’ve also been recently called into the young women’s program to work with the Mia Maids and was wanting to do the personal program all over again. I am totally going to do your program as well! I can’t wait to see what else you do with it. How fun! I finished everything up yesterday and will be sharing all of the details soon! This looks fabulous! I think I need to print this! I can send you the entire binder I made, 12 in all. It’s all editable if you want to make changes. Could you also send it to me? I would love to have it! I find this to be an awesome idea and would definitely love to start on something like this myself! This is fantastic! I do something similar with my Franklin Covey Planner with key roles and goals each year, but I am loving this Personal Progress report binder of yours that includes a wonderful spiritual aspect to is as well. Would it be okay to ask if you could send me a copy of your binder as well? I am such an organization junkie! 🙂 And, since I never did the Young Women’s program for too long, I had been wanting to do it last year and never got around to it. Good Luck and I will be rooting for you! Of course Yolanda, I’ll try and get it sent tonight or tomorrow. oh my goodness, this is what i have been looking for! i have been wanting to do something like this for so long! my little guy is turning one and i have felt like i haven’t really been going anywhere either! i really can’t wait for you to put up your printables and everything! Britanie, I just emailed you and posted all of the printables. I’m so glad you like the idea, can’t wait to hear about your progress this year! Britni – What I wonderful idea. I look forward to watching your journey and see how much you grow. I just emailed it to you Amber! You can actually download it directly from the post by clicking on the download links. If that doesn’t work for you, let me know. Hi Amber, you can actually download the entire thing in the post. If you can’t find it, feel free to email me at britni@playpartypin.com and I’ll send it over. This is absolutely inspiring!! Is there a version you could email me that could be edited? Thank you so much for sharing! !